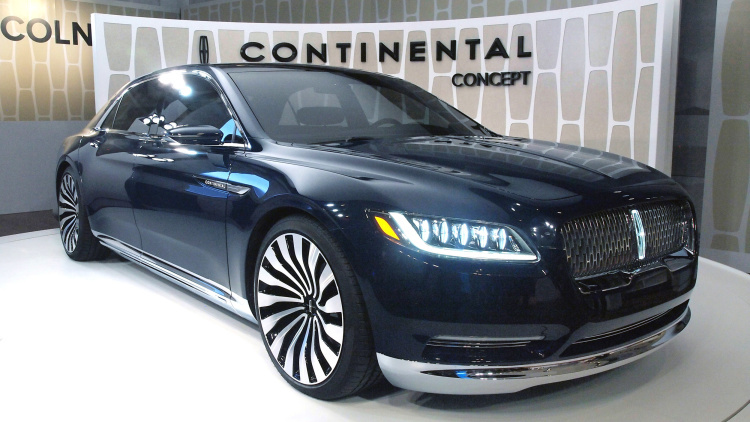 Lincoln is making a huge splash in New York this week, rolling out the Continental Concept you see here. Not only does this bring back an iconic bit of Lincoln nomenclature (just as some competitors are making things more complicated), it previews the new Continental fullsize sedan that will come to market next year. There’s no other way to say it: the Continental looks stunning. It’s a long, low-slung sedan, with a shape that’s reminiscent of the Ford Interceptor Concept from 2007. But this thing is all Lincoln, and shows a host of new design cues that will no doubt work their way across the brand’s range. Most notably, the split-wing grille is gone, with this new chrome centerpiece showing a “new face for Lincoln” (where have we heard that before?). The Continental also incorporates LED matrix headlamps, with laser-assist high-beams and tiny Lincoln logos embedded inside. For the doors, Lincoln uses “E-Latch” handles that tuck discretely into the Continental’s beltine. The concept rolls on polished aluminum, 21-inch wheels with painted pockets. Up above, the Continental has a SPD SmartGlass tinting sunroof that can keep the interior up to 18 degrees cooler. Around back, the Continental has a wide, planted stance, with taillamps that stretch from side to side. These lamps have “light-through-chrome” technology, which means they have a chrome look when not illuminated. Rounding out the whole design are slim, wide exhaust outlets that look fantastic. The main focus of the Continental is luxury, and Lincoln says this car uses “the brand’s most sensual materials ever.” That includes Venetian leather seats and door panels, Alcantara on the seat inserts and armrests, a satin headliner and wool carpet. Lighting is also a key feature, with an ambient glow that radiates throughout the cabin and “soft-gold” LED lights in the center console. As for comfort, the Continental’s 30-way seats are said to mold to passengers’ sizes and shapes. Rear seat passengers have it best, though, with a two-seat layout, tray tables, a champagne storage compartment, and detachable, handmade Venetian leather travel cases. It’s the sort of thing you’d expect in a long-wheelbase S-Class, and shows Lincoln’s intent to reclaim its historic position among the world’s best brands (even if it has a long way to go in the showroom). Lincoln won’t reavel too many details about what’s under the hood, only saying that the Continental uses an all-new, 3.0-liter EcoBoost V6 that is said to be exclusive to the brand. Mum’s the word about drivetrain as well, but we’re really hoping for rear-wheel drive – in line with long-standing rumors. No matter, the Continental Concept is a seriously sweet thing, and we can’t wait to see how it transforms into a production car next year. Check it out in the videos below, and look beyond that for Lincoln’s official press blast.